Check below for updates about the Cottonwood Drive reconstruction. You can use the contact form to sign up for weekly construction updates, and you can also use it to ask us any questions you might have about the project! The closure for the Cottonwood Drive reconstruction project will remain in place for the duration of the winter and into the spring. Cottonwood Drive between Baldwin Street and Bauer Road remains closed to through traffic until crews return in the spring to finish paving the top course of asphalt. For those who live and work within the project limits, access will be maintained during the winter months, and the Ottawa County Road Commission will provide winter maintenance on the road. Paving contractors have finished placing the base and leveling course of asphalt on the road, and temporary lane markings have been put in place to allow the local traffic to use one lane in each direction, plus a center turn lane. The existing barricades will be moved on Cottonwood to improve the flow of traffic and accessibility for those living and doing business within the project limits. This includes the removal of the temporary closure at Village Lane and moving the Cottonwood closure at Bauer Road to the south of the intersection. As Cottonwood Drive is still closed to through traffic, we ask for everyone’s cooperation and safety in spreading the word that those who do not live within the project limits should take the posted detours, which is Baldwin Street to 20th Avenue to Bauer Road to 24th Avenue to Fillmore Street. We also remind motorists that the speed limit along Cottonwood Drive construction zone will remain 25 miles per hour. Residents should be reminded that mailboxes will be maintained on the westerly side of the road for the winter months, and we also ask that those who use a private plow service, relay to them to be careful not to damage the curb while plowing this winter. We appreciate everyone’s patience and understanding as we work through this project, and are eager to return in the spring to finish up work on this project. Work continues to take place on Cottonwood Drive. We anticipate that paving contractors will be on site on Monday, Dec. 10, to begin basing and leveling the remaining portion of Cottonwood Drive, as well as beginning work to pave intersections along the eastern side of Cottonwood. Work is also taking place on concrete driveway approaches along the eastern half of Cottonwood Drive. Even with the new pavement on portions of both sides of Cottonwood, we remind people that the road remains closed to through traffic. Additionally, Cottonwood Drive remains closed at Village Lane to to aid in the completion of the project. 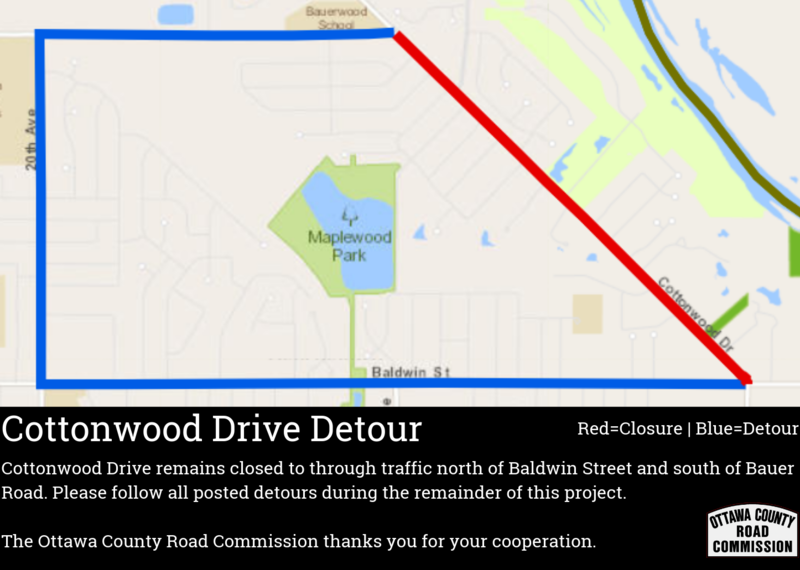 Those who live north of Village Lane and south of Bauer Road are asked to access Cottonwood Drive via Bauer, while those who live south of Village Lane and north of Baldwin are asked to access Cottonwood via Baldwin. Follow all posted detours and observe all posted speed limits for the duration of this project. Crews from Superior Asphalt were on site Thursday to pave the base leveling course of asphalt on the east side of Cottonwood, from Bauer Road to Village Lane. It’s possible that work could then take place Friday, Nov. 30, to pave the center lane of Cottonwood, from Bauer to Village Lane. Per MDOT standards, paving can take place as long as the ground temperature – not air temperature – is at least 32 degrees. Any future days of work will be evaluated for conditions, making sure that they are acceptable and meet MDOT specifications for work. Those who live north of Village Lane are asked to access Cottonwood Drive via Bauer Road, while those who live south of Village Lane are asked to access Cottonwood via Baldwin. Please follow all posted detours and speed limits. Despite the chilly temperatures and the heavy snow that fell earlier in the week, work continues out on Cottonwood Drive. This week, work crews are working on finishing up segments of sidewalk and driveway approaches on the east side of the road. Heavy equipment operators also continue to work on site, grading the east side of the road in anticipation of placing asphalt. Contractors say they are still optimistic about getting work done this season, and say they hope to begin paving any day now — either later this week or early next week — on the east side of the road, weather permitting. Regarding winter maintenance along Cottonwood: We are working with MDOT and the contractor to make sure that the area is plowed and maintained while the site is under construction, and if work needs to be postponed for the winter. This will ensure that we avoid a repeat of the lack of winter maintenance that occurred on Monday, Nov. 28, where the road should have been maintained by the project contractor. REMINDER: Cottonwood Drive is closed at Village Lane to to aid in the completion of the Cottonwood Drive reconstruction project. Those who live north of Village Lane are asked to access Cottonwood Drive via Bauer Road, while those who live south of Village Lane are asked to access Cottonwood via Baldwin. Reconstruction in Georgetown Township continues to progress. Crews were on site to begin the process of installing new concrete curb and gutter along the east side of the widened road. Work that needs to be completed next includes paving, working on east side driveways, marking pavement, completing sidewalk installation and performing site restoration. Much of the remaining work is weather-dependent, so no exact date yet for completion. Those living north of Village Lane are asked to access Cottonwood Drive via Bauer Road, while those living south of Village Lane are asked to access Cottonwood via Baldwin. The snow may be flying here in West Michigan, but outside, work continues on the Cottonwood Drive reconstruction project. Contractors are nearing the end of the widening phase of the project and installing new drainage structures along the eastern side of the road. The next phase of the widening portion of the project will involve placing new concrete curb along the east side of the road, which should tentatively begin on Monday. On the west side of the road, work this week finished up on installing driveway approaches and sidewalk, with some final sidewalk work to be done down the road, and crews also did some work in some intersections with paving another course of asphalt. Once crews get the curb installed on the east side of Cottonwood, they can begin paving the east side of the road. That said, weather remains the X-factor, and could cause schedules to change. Contractors continue to make headway on the easterly side of Cottonwood Drive following paving of base and leveling courses of asphalt on the westerly side of the road last week. With the old road surface removed, contractors continue to install storm water catch basins along the eastern side of Cottonwood Drive. The goal is to complete the installation of the catch basins by the end of this week. If crews are able to get the storm water catch basins installed this week, work will begin over the next two weeks to install new concrete curb and gutter, and segments of sidewalk on the east side of Cottonwood. On the west side of Cottonwood, work continues on concrete driveway and sidewalk installation. Watch for lane closures as crews pour new concrete surfaces. Over the next two weeks, also anticipate crews to come out and complete the leveling course of asphalt in the intersections along the westerly side of Cottonwood. Please be reminded that Cottonwood Drive remains closed to thru traffic for the duration of the reconstruction project. The detour route for the project is Baldwin Street to 20th Avenue to Bauer Road to 24th Avenue to Fillmore Street. Contractors have paved a base course of asphalt on the westerly side of Cottonwood Drive from Baldwin Street up to just north of Elmwood, and crews are expected to be back out to base the rest of the westerly side of the road by the end of the week. Meanwhile, crews are beginning the process of pulverizing the eastern side of the road for widening/repaving. Please follow all posted detour/any lane shifts, and remember that Cottonwood Drive remains closed to thru traffic. Please take note that paving crews will be on site at Cottonwood Drive on Tuesday, Oct. 23, to begin paving the base course of asphalt on the westerly lanes of Cottonwood, from Baldwin to Bauer roads. Crews were on site today grading the road in advance of paving. During the paving process, we would ask that you be patient as pavers work their way down the westerly side of Cottonwood. There may be times when access to driveways and intersections is limited. If this occurs, motorists will be asked to wait to travel the lanes until pavement cools, or park and walk to their destination until the road is in a driveable condition. Work crews will try to maintain traffic flow as much as possible Tuesday through the construction zone for those who live and work along Cottonwood. As a reminder, Cottonwood is still closed to thru traffic. Please follow all posted detour routes. The detour route for the project is Baldwin Street to 20th Avenue to Bauer Road to 24th Avenue to Fillmore Street.